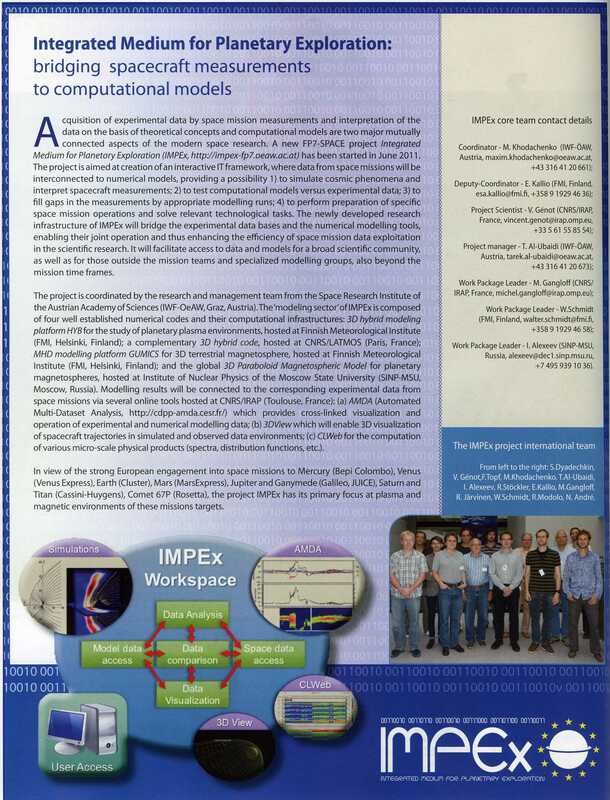 Articles, journal and book publications related to the IMPEx project. 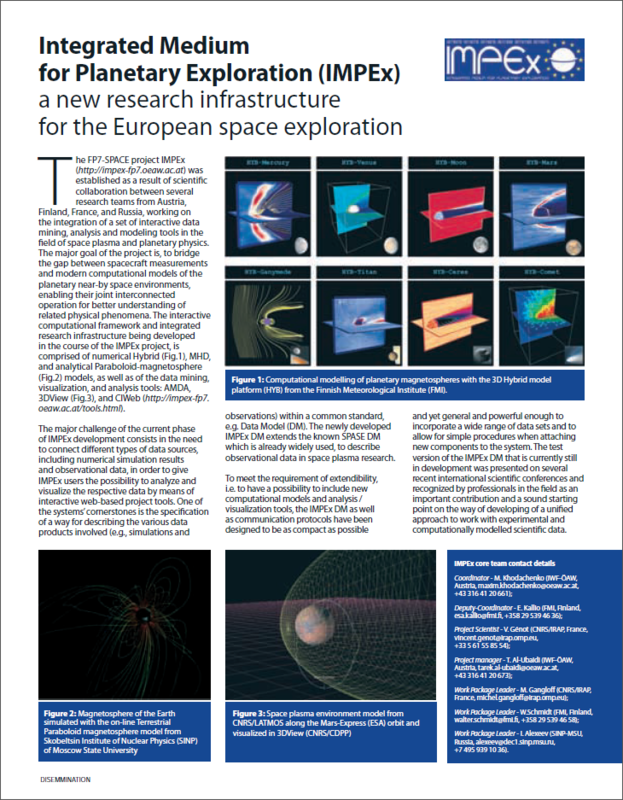 The Space Research Journal featured a two page article on the projects' basic goals and participating institutions. The Parliament Magazine in its November 2011 issue had a special focus on space related policy making and decisions. It also featured an article on the IMPEx project. The Parliament Magazine focused on social, economic and environmental benefits of space in its October issue of 2012. It again also featured an article on IMPEx describing the latest developments of the project. The book presents the proceedings of the International Astrophysics Forum Alpbach 2011. The contributions discuss the latest advances in the exploration of dynamical behavior in space plasmas environments, including comprehensive approaches to theoretical, experimental and numerical aspects. References to IMPEx on pages 215 and 225. In 2014 the vienna based PR company PR&D was engaged to write an article on recent developments in IMPEx. The article was released by APA (Austria Presse Agentur) in english as well as german language and mainly focused on the release of the IMPEx data model 1.0 and its first applications across the science community. The article was featured in several print (example "Kleine Zeitung") as well as on-line (example "Wiener Zeitung") media. Characterizing Stellar and Exoplanetary Environments, Astrophysics and Space Science Library, Vol. 411, Lammer, Helmut, Khodachenko, Maxim (Eds. ), Springer, 2015. The book is divided into four main parts, grouping chapters on exoplanet host star radiation and plasma environments, exoplanet upper atmosphere and environment observations, exoplanet and stellar magnetospheres, and exoplanet observation and characterization. As already in 2014 Vienna based PR company PR&D was engaged to write an article on recent developments in IMPEx. The article was released by APA (Austria Presse Agentur) in German language and was additionally translated into English, Finnish and Russian. This year's article is mainly focusing on practical applications of the IMPEx protocol and data model. The article was featured in over 70 media coverages, among them print (example "develop3 systems engineering") as well as on-line (example "science 2.0") media. Press release related images can be downloaded here.